In their pathbreaking article “A Theory of Rational Addiction”, published 1988 in the Journal of Political Economy, Gary S. Becker and Kevin M. Murphy propose that addictive behavior could be usefully integrated in the rational choice framework. According to their theory, consumers are forward-looking in their decision making and calculate present and future consequences of consuming an addictive good. Becker and Murphy even claim that analyzing addictions as a rational choice offers new insights and a better understanding of addiction.Earlier economic models typically explain addictions with irrational or myopic behavior in which individuals ignore or highly discount the future when making their decisions. While the rational addiction model has become a standard tool in the economic analysis of addictive behavior,it has also been subject to much criticism. As shown in section 3, there is much evidence that the model’s assumptions are unrealistic. It is argued however that the model’s predictions rather than its assumptions should be rejected based on the empirical evidence.By reviewing empirical studies which tested the Becker Murphy model, this paper seeks to examine to what extent the rational choice approach can be legitimately applied to addictive behavior. In section 2 the model’s assumptions and implications will be explained. Following in section 3, I will discuss the main criticisms about the theory. In section 4, I will then review the most relevant studies that tested model and discuss the implications in section 5. Becker and Murphy define rational behavior as being utility maximizing, having stable preferences and trying to anticipate future consequences when making choices.In their framework, a person is potentially addicted if an increase in his current consumption increases his future consumption of the addictive good. 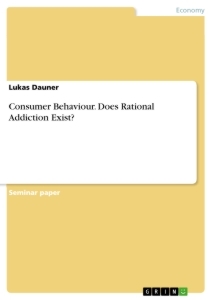 In the rational addiction model, which builds on a model introduced by Stigler and Becker in 1977 and further developed by Iannaccone in 1984 and 1986,individuals weigh present and future utility of consuming an addictive substance. Consumers then maximize the total discounted value of utility over their life span subject to a budget constraint. If T equals length of life and σ is a constant rate of time preference the discounted life-time utility would be whereas u(t) would be the utility in period t, y a non-addictive good, c an addictive good and S(t) the stock of “consumption capital”. Consumption capital is a function of past consumption of the addictive good depreciated at rate δ and negatively affecting utility of the current period. The change over time of the individual’s stock of consumption capital can be described as where stands for the effect of the expenditures on endogenous depreciation or appreciation. Tolerance: The higher consumption levels have been in the past the smaller utility individuals gets from consumption in the present: . Withdrawal: Addicted individuals’ utility fall when they consume less of the addictive good: . Reinforcement: The higher consumption levels have been in the past the higher consumption is in the present.: . Reinforcement is closely related to the concept of adjacent complementary which means that present and future consumption of addictive goods are complements. In the model, adjacent complementary reflects the potential addictiveness of a good towards an individual. It is a fundamental concept of the theory that helps explaining binge behavior and “cold turkey” quit behavior of addicts.Adjacent complementary implies that expected price increases of addictive goods in the future reduce consumption in the present.More specifically, the model predicts low price elasticity of demand in the short-term and higher ones in the long-term.This turns out to be a key contention of the model. Becker and Murphy show that potentially addictive goods, respectively adjacent complementary, can lead to unstable steady states in the model. These unstable steady states lead to a bimodal distribution which is observed for many addictive goods. The model also explains how a rational consumer can find himself in a high-consumption steady state with a lower utility than at a low-consumption state. In Figure 1, curve p1s1 is the consumption path of an individual with a high time preference σ. The model implies that individuals with a high time preference get potentially more addicted than future-oriented individuals. (S*0,c*0) is an unstable steady state with a low consumption of the addictive good and (S*1,c*1) is a stable steady state with higher consumption and lower utility than the low-consumption state. Under normal circumstances a rational consumer would not end up at the inferior steady state. Becker and Murphy show that a sudden distress, e.g. a divorce, can bring consumption levels up along the consumption path until (S*1,c*1) is reached. Now, the individual is “stuck” in the addiction because the disutility that comes with the addiction is smaller than the disutility of withdrawal. One of the most criticized assumptions of the model is the one of perfect foresight.In the context of the Stigler and Becker model from 1977, Winston criticizes the theory isn’t able to explain social problems, compulsive behavior or why people would pay money to get rid of their addictions, because rational individuals decide from the beginning that the addiction – including all consequences – would give them the greatest satisfaction out of life.Comparatively, Akerlof criticizes the lack of regret in the rational addiction model.And Subsequently, Orphanides and Zervos note that in the model people are never fooled or “hooked” into an addiction and thus, there is no need for education programs that provide information regarding the potential danger of addictive goods. The assumption of time-consistent preferences has also been frequent subject to criticism because of strong psychological evidence that humans are time-inconsistent in their behavior.Accordingly, Skog argues that addicts are characterized by akrasia which indicates unstable preferences.Furthermore, he claims that the model is not explaining addiction but rather so called “above heavy” or problem consumption. The closest the model gets to addiction is when consumers have reached an inferior steady state of high consumption and their own utility calculation does not allow them to quit. However, they knew that from the beginning and they can always decide to quit. If they do not quit it’s because they do not want to. Another common point of criticism is the implementation of exponential discounting since empirical evidence suggests that hyperbolic discounting explains addictive behavior more realistically. In disciplines other than economics, the model may be seen no less controversial. Social and political scientist Jon Elster, for example, notes that there are different degrees of addictive behavior, from a harmless habit on the one side of the scale to e.g. a self-destructive gambling addiction. And, he finds it impossible to believe that in the latter case the addict calculated all the consequences with perfect foresight and came to the conclusion that the addiction is his best outcome.Health psychologist Robert West claims that the theory is used by the alcohol and tobacco industry to argue that the state should refrain from interfering in the market. He states that the assumptions of the rational addiction theory conflict with accepted knowledge about addictive behaviors and has not performed well in predicting these behaviors.For example, he finds the theory’s claim that distress leads individuals into addiction and keeps them in it to be contradicted by studies which show that well-being of smokers does not fall but rather improve after quitting. The theoretical implications of the rational addiction model have been empirically tested by numerous studies over the years. Most of them focused on the theory’s empirical prediction that consumption of addictive substances today depends on past and future consumption (adjacent complementary). More specifically, the researchers have assessed whether higher prices in the future lead to lower consumption today, as predicted by the model.The following studies are the most prominent and representative to test the rational addiction theory. Employing findings on cigarette consumption from the second National Health and Nutrition Examination Survey, Chaloupka is the first to empirically test the rational addiction model’s predictions with microdata.The data was conducted from approximately 28,000 people aged 6 months to 74 years during the period from 1976 to 1980. Based on his estimates, Chaloupka finds support for Becker and Murphy’s predicted price effect. Furthermore, he found consistent evidence for the Becker-Murphy Model in the estimation of separate demand equations for subsamples based on education or age. Future consumption has stronger effects on current consumption of older or more educated individuals which is in accordance with the model’s assumptions. Keeler et al. base their study on a natural experiment, a tax increase on cigarettes from 10 cents to 35 cents per pack in California in 1989, to check the hypothesis of rational addiction.The Analysis is based on monthly time-series data in the period from 1980 to 1990. Since their analysis is based on monthly time-series data, the study can only narrowly test the rational addiction hypothesis which is primarily explaining long-term responses. Nevertheless, they find some evidence supporting the model of rational addiction as they are able to model current cigarette consumption as a function of past and future consumption. In this study Becker and Murphy, together with Grossman, use aggregate annual per capita sales data for cigarettes in U.S. states over the period from 1955 to 1985 to test the implication of their rational addiction model that current consumption of the addictive good is depended future consumption.Due to the endogeneity of future consumption the authors use future prices as an instrument for future consumption. Based on the statistical significance of future prices as a determinant of current prices, they can reject myopic models of addictive behavior and find overall support for the rational addiction theory. However, the estimated discount factor is not consistent with the rational addiction theory. The authors conclude though that the data did not offer enough information for accurate estimates of discount rates. Conniffe tests the rational addiction model with data of tobacco consumption, employing time series data annually conducted in Ireland in the period from 1960 to 1990. Using a similar approach to Becker, Grossmann and Murphy (1994), the estimates for lagged and future consumption are clearlyinsignificant.Smokers seem to be unaffected by price and income and the results suggest rejecting the rational addiction model. Since several studies tested the rational addiction model with data on tobacco, Olekalns and Bardsley assess the model’s performance on another addictive commodity: caffeine; which is suitable due to its addictiveness and data sufficiency as they point out.Olekans and Bardsely use annual data on prices and per capita consumption in the U.S. between 1967 and 1992.Their results support the rational addiction framework. Grossmann et al. test a panel of young adults for rational addiction arguing that this sample of the population may be most relevant because of the high rates of alcohol dependence and abuse.The study uses biennially conducted cross-sectional survey data of U.S. high school seniors between the ages of 17 to 29 years. The authors find clear indications of adjacent complementary in their estimates which is inconsistent with myopic models of addiction. Likewise such Becker, Grossman and Murphy (1994), they reason that their discount factor – which would be too high to be consistent with the rational addiction model – cannot be precisely estimated with their data. Therefore, they give support to the rational addiction model. Similar to Chaloupka, Labeaga uses microdata to assess the rational addiction model, however he applies a double-hurdle specification to overcome the censoring nature of the dependent variable which has been ignored by previous studies.The study uses panel data of approximately 2000 Spanish households collected in the period from 1977 to 1983. As the previous mentioned studies, the results of Labeaga’s study also give support to the rational addiction model while rejecting the myopic one. This study is the first to empirically test the rational addiction model’s assumptions about systematic variations in people’s discount rates.As outlined in section 2, the rational addiction model assumes that individuals’ time preferences are stable, alter inter-personally and that high time preferences are one contributory factor to cause addiction. Bretteville-Jensen estimates discount rates from three groups: active injecting addicts, non-users with corresponding demographic characteristics as the active misuser group and former misusers of heroin and amphetamine. Consistent with Becker and Murphy, Bretteville-Jensen’s estimated discount rates of active users are significantly higher than those of non-users. Ex-users’ significantly lower discount rates could be caused by selection bias, but could also indicate time preferences to be endogenous which would mean that addictive behavior itself would change an individual’s time preference, i.e. that preferences weren’t stable. Bretteville-Jensen concludes that due to the nature of the data and methods used, the results can neither give evidence for conformation nor rejection of the assumption of stable in preferences. In their paper, Gruber and Köszegi discuss certain issues with previous tests of the rational addiction model. Among other things, they criticize the assumption that individuals could forecast prices far in advance and note that earlier tests weren’t able to distinguish true future price effects from failure of a specification test in the model. To overcome those issues, the authors examine how consumption changes when a tax change is already announced, but not yet effective.They use data on cigarette consumption, as well as sales, matched to information on the enactment and effective dates of all state level cigarette excise tax increases from 1973 to 1996. Gruber and Köszegi find that cigarette consumption does fall when future price increases are announced but not yet effective which is a convincing evidence for forward-looking behavior and adjacent complimentary, clearly rejecting myopic models of addiction. Cf. Becker and Murphy (1988), p. 675; Gruber and Köszegi (2001), p. 1262. Cf. Baltagi and Griffin (2001), p. 449. Cf. Ferguson (2000), p. 587. Cf. Sloan and Wang (2008), p. 1778. Cf. Becker and Murphy (1988), p. 675. Cf. Becker and Murphy (1988), p. 681. Cf. Becker and Murphy (1988), p. 676. Cf. Becker and Murphy (1988), p. 681f. ; Chaloupka, Emery and Liang (2003), p. 77; Bretteville-Jensen (2003), p. 282. Cf. Becker and Murphy (1988), p. 680-684; Chaloupka, Emery and Liang (2003), p. 77f. Cf. Becker and Murphy (1988), p. 689. Cf. Becker and Murphy (1988), p. 694f. Cf. Becker and Murphy (1988), p. 683; Chaloupka, Emery and Liang (2003), p. 78. Source: Becker and Murphy (1988), p. 681. Cf. Becker and Murphy (1988), p. 680-683, 690f. ; Bretteville-Jensen (2003), p. 283. Cf. Chaloupka, Emery and Liang (2003), p. 79. Cf. Winston (1980), p. 302. Cf. Akerlof (1991), p. 9. Cf. Orphanides and Zervos (1995), p. 740. Cf. Gruber and Köszegi (2001), p. 1277. Cf. Skog (1999), p. 201f. Cf. Skog (2003), p. 165. Cf. Vuchinich and Hether (2003), p. 12f., 26; Kirby, Petry, and Bickel (1999), p. 87f. Cf. West and Brown (2013), p. 48f. ; Shahab and West (2012), p.38. Cf. Gruber and Köszegi (2001), p. 1262. Cf. Chaloupka (1991), p. 724. Cf. Chaloupka (1991), p. 731. Cf. Chaloupka (1991), p. 740f. Cf. Keeler et al. (1993), p. 2. Cf. Keeler et al. (1993), p. 7–10. Cf. Keeler et al. (1993), p. 15–17. Cf. Becker, Grossman and Murphy (1994), p. 396f. Cf. Becker, Grossman and Murphy (1994), p. 399. Cf. Becker, Grossmann and Murphy (1994), p. 407. Cf. Conniffe (1995), p. 337. Cf. Conniffe (1995), p. 340. Cf. Conniffe (1995), p. 344f. Cf. Olekalns and Bardseky (1996), p. 1101. Cf. Olekalns and Bardseky (1996), p. 1102. Cf. Olekalns and Bardseky (1996), p. 1104. Cf. Grossman, Chaloupka and Sirtalan (1998), p. 40. Cf. Grossman, Chaloupka and Sirtalan (1998), p. 40, 42. Cf. Grossman, Chaloupka, and Sirtalan (1998), p. 45f. Cf. Labeaga (1999), p. 50. Cf. Labeaga (1999), p. 60. Cf. Labeaga (1999), p. 49. Cf. Bretteville-Jensen (1999), p. 394f. Cf. Bretteville-Jensen (1999), p. 395, 402. Source: Bretteville-Jensen (1999), p. 402. Cf. Bretteville-Jensen (1999), p. 404-405. Cf. Gruber and Köszegi (2001), p. 1265f. Cf. Gruber and Köszegi (2001), p. 1263, 1267. Cf. Gruber and Köszegi (2001), p. 1267. Cf. Gruber and Köszegi (2001), p 1293.